A large and sprawling group of about two hundred gathered in front of North Melbourne grandstand at Arden Street circa mid-late thirties. The SLV’s ‘guernsey’ appellation is inaccurate and misleading. About half of the group are wearing striped (blue and white?) blazers, not guernseys. Also, ostensibly, there is nothing at all in the picture to suggest this is a group of footballers. However, somewhat conspicuous at the front of the throng is Arthur Calwell. Calwell, who was to become the leader of the Federal parliamentary Labor Party, had a longstanding association with the North Melbourne Football Club. He was North Melbourne President 1929-34 when the club was still very Roman Catholic in character. So I suspect this group may be a gathering of North Melbourne past players (and officials presumably). Without absolute certainty, former North players Tom Fitzmaurice, Johnny Gregory and Wally Carter are also detected in the group. 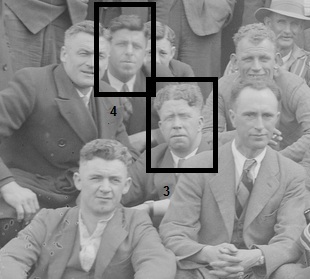 Gregory and Fitzmaurice appear on the left of the group and Wally Carter appears just behind Calwell. Possibly Johnny Meere (official) just in front of Fitzmaurice. Note one of the group is wearing a twenties-style North Melbourne jumper (blue with white ‘V’). 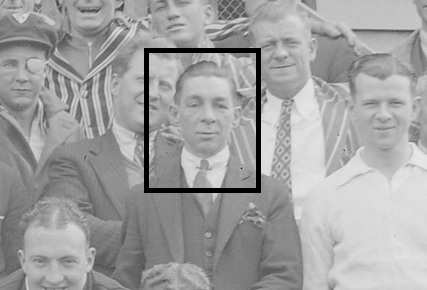 A partially obscured face is probably Neville Huggins who played for North Melbourne 1931-35. A number of people surrounding 'Huggins' are partially identified. 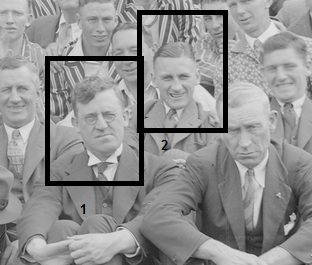 For example the person on the far right appears as a player in 122_126 - Probably Essendon Seconds team - circa 1939. Different Crop of photo below - Person on left of photo below is in the Essendon Seconds photo.